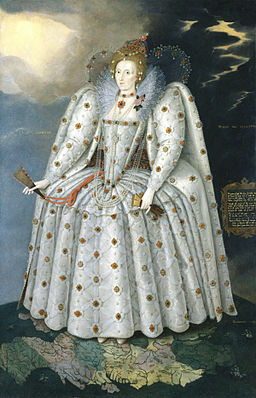 Queen Elizabeth I reigned over England from 17th November 1558 until she died in 1603. She had red hair and coloured her skin lily-white by using make-up from white lead mixed with vinegar. She liked hunting and enjoyed court masques (entertainment of poetry, songs and dancing). She was also very well educated and was fluent in six languages. Elizabeth tried to bring Catholics and Protestants together. She did not believe that people should be punished for what they believed in, but she was strict about people keeping to the rules of the church. She did not marry and was known as the Virgin Queen because she had no children. Many foreign kings wanted to marry her but she said that she was married to England. The person with the most legitimate claim to follow Elizabeth to the throne of England was her cousin, Mary Stuart, who was already Queen of Scotland. Mary Stuart and Elizabeth were rivals as Mary was a Catholic and Elizabeth was a Protestant. In 1578, Elizabeth was told that Mary had been plotting to kill her and become queen in her place. Mary was put on trial and found guilty, and Elizabeth agreed to put Mary to death. This action was popular with Elizabeth's court, but it made her enemies in the Catholic countries of Europe, such as France and Spain.